Managed VPS & Great Cloud Features. Virtual Private Server Hosting is an innovative approach to partitioning physical servers into several virtual machines. It is the future of modern hosting as it provides the power and functionality of a high-end dedicated server but at a much lower price. By purchasing a VPS you get a 100% individual machine with root access and your own dedicated CPU and RAM. Having a fast, scalable VPS is important, however these features take a backseat if your service is put on hold. This is why we have invested a great deal of focus into building our industry leading support team. With immediate, 24/7/365 access to qualified, on-site support engineers available via email, livechat, or telephone, all of your questions – whether, managed services, best effort, or beyond– are answered quickly and effectively. 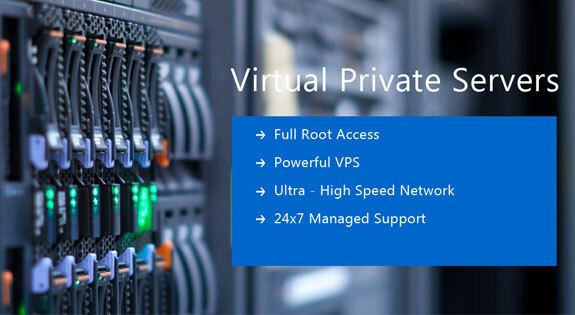 Get A Virtual Private Server you get huge space and bandwidth.